Since its launch in 2002, the Nourish the Children initiative has provided more than 180,000,000 servings of VitaMeal to malnourished children around the world. Our goal is to exceed 200 million meals in 2010. Join us today in helping to feed—and save—children. At Nu Skin, we celebrate that improvement because we took part in it. More than 115 million servings of locally-produced nutritious VitaMeal distributed to children in Malawi is making a measurable difference. Often, the only food Malawian children receive is “nsima.” Nutritional analysis of this staple made from maize reveals that it contains no vitamin C, B1, B2, B6, or niacin and only low levels of other nutrients. Even if Malawian children have full tummies, they may still suffer from malnutrition. Conversely, expertly-formulated VitaMeal contains 25 essential vitamins and minerals and a balance of electrolytes and nutrients. 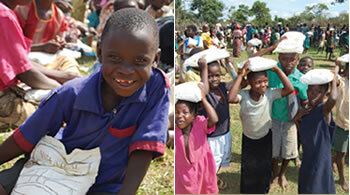 More than 60,000 children receive VitaMeal in Malawi each day at school or through village programs. But malnutrition affects more than 500,000 children under five years of age. By purchasing and donating one more bag of VitaMeal each month, we can work together to come closer to our goal of eliminating hunger. With other charities you donate cash and have no idea how your donation is spent. With Nourish the Children, you donate food instead of cash so you know exactly what you purchased and that it will feed a child in need. It is easy to Nourish One More Child. Click here to purchase and donate one more bag of VitaMeal.